Just Talk to Me... From Private Voice To Public Speaker which I was expecting to be a con job - is not. I found it fascinating. If you have any insecurities about public speaking or communicating it will advance you. It's splendid and I recommend. Peter Settelen was said to have taught the Princess of Wales to talk in public. 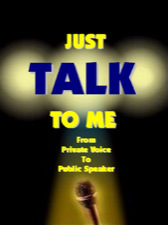 Just Talk to Me... is a useful book, full of valuable advice on communicating with others from one to thousands. He explains how to make speeches and how to be understood. Neil Kinnock was accused of having the power of speech but not the power of communication. He could have learnt much from Settelen. ...this could be an essential ingredient in the knapsack of every public figure. His greatest strength revealed in his groundbreaking book Just Talk To Me... is the way in which he faces and unlocks the fear and self destruct mechanisms and unproductive facades with which we all limit ourselves. ... I found it a wonderfully releasing journey and one I expect to return to frequently. A desire to be thorough and honest is the lasting impression this book gave me. Follow his rhetorical route and you'll address 'Anne and Nick' or the House of Lords with equal aplomb. As a professional speaker being authentic is critical to success and this is where this book and Peter's work are invaluable and helped me in my personal speaking development. His amazing success with Princess Diana in empowering her to be herself is translated into an easy to follow book with lots of practical exercises. I have used these exercises myself when coaching speakers and can personally vouch for their effectiveness. Your book has performed a miracle in my personal growth. I have been doing presentations to small and large groups. I still recognise that there is plenty of room for improvement. People have commented that I am very relaxed when I'm speaking. I'm singing more confidently in church and I'm projecting my voice more clearly and in key! As for your book on the net, it is fantastic. Your ebook is sensational! I really enjoy reading it. Listen to a BBC Radio interview given by Peter Settelen about "Just Talk To Me..."